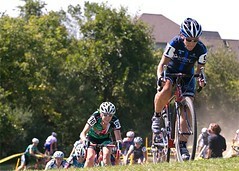 Beth Mason is a licensed physical therapist, certified bike fitter, and Cat 1 road and cyclocross racer. This triple threat of experience provides Beth with a rock solid perspective on common fit issues facing anyone toeing the line at a cyclocross event. As you read our interview, you will quickly find that Beth provides excellent information that should really help people get started on properly setting up their race rigs and addressing some common fit issues. But the bottom line is that we are all built differently and to truly get dialed in on your bike, you need to go hire somebody like Beth to do it right. MASON: Kind of, but not really. My parents both rode bikes when I was growing up, and some of my earliest memories were on the back of my Mom’s bike in a toddler seat. My Dad got into doing some tours, like the Tour de Cure, when I was a teenager, and I did a couple with him. Nobody in my family was very serious about it, though. There definitely was no bike racing going on. CXHairs: When did you start riding? When was your first race? MASON: I started riding in my teenage years. We lived in the hill towns rural western Massachusetts and I didn’t have anything else to do. I didn’t have my own bike, so I would ride my Mom’s Vitus Cilo, which was pretty sweet. In 1994, when I was 24 I joined the Army and started my Master’s in Physical Therapy in Texas. I had to get a new bike because my mother wanted her bike back (killjoy). I went to an LBS in San Antonio, Britton’s Bike Shop, and I bought a sweet (albeit too big for me) Colnago. The owner of the shop, Jim Britton, talked me into coming out on their Saturday group ride. That was my first group ride. It was not a “no-drop” ride, and I killed myself to stay with the front group of guys (who were Cat 2s and 3s), because I had no idea where I was. We started with about 30 people, and finished with 8-me and 7 guys. After that, they kept pestering me about racing. I finally gave in and did my first race in 1996 in a Texas industrial park. I wasn’t last. CXHairs: When did you start racing cyclocross? MASON: I started racing cyclocross in 2000 in Virginia. I was stationed at Ft. Lee in Petersburg, Va. at the time. Petersburg is essentially the Richmond area, so I did a lot of races that year in Richmond. The women’s fields were tiny, and compared to the other women that were racing, I was pretty good. In December of 2000 I had my first child, Tyler. We moved in 2001 to Hawaii, where I spent my next 3 years. Sadly enough, Hawaii doesn’t have cyclocross. Hawaii is actually a pretty crappy place to be if you like racing your bike (without aero bars). I decided to spawn my second child in lieu of racing while I was there. Cadence was born in November of 2003, and we moved back to the mainland in 2004. I was stationed at Walter Reed in D.C. at the time, and my friend Jen Maxwell (Kenda) talked me into starting cyclocross again. Wow, did the sport grow in 4 years! I was an “A”, mostly by default as a Cat 1 roadie. I got my behind handed to me in a very big way in the first couple of races I attempted that year. I decided to hang up the cross bike after 3 races in 2005. In 2006 I gave it another go, and I got a little better. In 2007 I went to a one-day ‘cross camp in Reston, Va. hosted by Chris Mayhew and John Verheul (www.jbvcoaching.com). I learned a lot that day, and 2007 ended up being my best season ever in ‘cross. CXHairs: You are a physical therapist and orthopedic certified specialist. Did I get that right? And what does that mean? MASON: You almost got that right! I am a Board Certified Orthopedic Clinical Specialist. The American Physical Therapy Association (APTA), a national professional organization representing more than 73,000 members throughout the United States, established the specialist certification program in 1978. Specialization is the process by which a physical therapist builds on a broad base of professional education and practice to develop a greater depth of knowledge and skills related to a particular area of practice. There are cardiopulmonary, clinical electrophysiologic, geriatric, neurologic, orthopedic, pediatric and sports specialists. I will sit for my sports specialty certification next year, when I complete my DScPT in Sports Medicine. CXHairs: You are a successful cyclocross racer and also run a bike fitting business. I think this sets you apart from many in your field. What I am hoping is that you can clear up some oft repeated “truths” about getting fit to a CX bike. I know that fit is unique to every rider but what are some general things you may do differently when fitting somebody to a CX bike as opposed to a road bike? MASON: Truthfully, nothing. If the fit were completely up to me, everyone would have the exact same fit that they have on their road bike (provided this fit is ideal). You hit the nail on the head, however, when you said that the fit is unique to every rider. The fit is never up to me (and nor should it be). Fitting a bike is a client driven business, and a bike fit needs to factor in each client’s biomechanics, injury history, and personal preferences. Some people swear they need wider bars on the ‘cross bike than they do on their road bike. I actually run wider bars on my cyclocross bike, and I like them. Some people talk about a lower and further aft saddle on the cross bike. This can be useful for some people to increase the ease of the remount. I think this saddle position is appropriate for technical mountain biking, when more time is spent hovering over your saddle than sitting on it. In cyclocross, however, you should be spending more time sitting on your saddle. CXHairs: You always hear that you should buy a frame one size smaller for ‘cross. Is that good advice? MASON: This varies by bike manufacturer. In general, this is usually true. Cyclocross bikes are made with a higher bottom bracket than on a road bike. The frame size is measured from the bottom bracket to the top tube (center to center or center to top, manufacturer dependent). With the bottom bracket starting higher off of the ground-say 2 cm, a 54 cm cyclocross bike will have a stand-over height that is 2 cm more than a similar 54 cm road bike. It is crucial to compare the measurement specs on a cyclocross bike with the specs from your current, well fitted, road bike. CXHairs: How about position on the bike, do you need to be more upright on a ‘cross bike then on a road rig? MASON: It isn’t as important to be low in cyclocross, with the slower speeds and less impact from the wind, so more upright might mean more comfort. I typically aim for the same back angle on a cyclocross bike as I do on a road bike, which is usually 40-45 degrees. In the end, my goal is to find the right position that will maximize rider comfort and pedaling economy. CXHairs: I know when I first started racing ‘cross my lower back would be killing me by the end of a race. This is a complaint I hear from a lot of people just starting to race. For me, really concentrating on strengthening my core took care of most of the pain. Is that going to be the case for most newbies or are there some common bike set-up mistakes that may contribute to the pain? Poor technique in the re-mount-the “Superman” will take its toll on your lower back, believe me. The bouncing around-those of us who primarily ride pavement are not accustomed to the jarring of the bike over a range of terrain. Invest in a set of tubies and drop the tire pressure-this helps out a LOT. Your saddle further back-you will be pulling a lot more with your hamstrings in this position. The hamstrings attach to your pelvis which attaches to your sacrum (tailbone) and then to your low back-causing a lot of extra work in this area and making it go “ow”. Running-again, something a lot of us aren’t used to doing, and the jarring can cause back pain. Mud-slogging through the thick stuff and lugging your heavy bike through it as well will cause your back to ache. Core strengthening is MUCH more important to the cyclocross racer than to the road racer. If I could recommend two exercises to concentrate on, it would be the plank and the side plank. CXHairs: You use the Retül fitting system. It looks pretty high-tech. Give us a run down of the fitting process. MASON: The Retül is a tool, and not a fitting system. By gathering data from eight key anatomical points in the cyclist’s riding position, fitters are able to profile existing (before) and ideal (after) angles for their client’s custom needs, which could be to gain more efficiency and performance, more comfort or maybe to fit the customer around an injury. The passive (static) data collection devices still used by many fitters today, such as a tape measure and plumb bob, are outdated and less accurate because they are subject to human error. Fitting with the Retül system however, provides sub-millimeter accurate dynamic data that is organized into an easy-to-read report for both the certified fitter as well as the cyclist. Having this data, however, does not provide any magical answers in how to adjust the bike to fit the client. The changes that I make to a rider’s position are based upon the readings of the Retül data combined with the individual’s unique biomechanics and comfort issues. CXHairs: How does your background in physical therapy help you in fitting somebody on a bike? MASON: I have to tell you, I absolutely LOVE doing bike fits, especially when someone has some kind of overuse injury or comfort complaint with their current fit. It is all a big puzzle to me, and I like my puzzles! My 13 years of experience as a Physical Therapist has uniquely prepared me to fit bikes. I have knowledge of a vast array of musculoskeletal disorders and certain methods of prevention as well as modifications that can be made to position to alleviate discomfort. I understand how the smallest changes to the forefoot varus angle can affect the alignment at the knee and hip. I can do an evaluation on biomechanics of a rider, and understand that there are certain positions that some people will not be able to achieve due to range of motion limitations. I believe that my background in PT helps me in every way to be a better bike fitter. CXHairs: Any other key fitting issues I haven’t asked about? MASON: Leg length and how it affects bike fit. The cyclist, when seated on the saddle, has to make each leg reach equidistant pedals. The sacrum, or tailbone, is stabilized on the saddle, so the accommodation is usually made by the rider by sliding slightly off-center to reach the pedal, by pointing the toes on the “short” leg to reach the pedal, or by some combination of these factors. Leg length differences in cycling can be the cause of one sided low back pain, knee pain, foot pain, Achilles tendinitis, and one sided saddle sores and saddle discomfort. This list is not inclusive. Leg length shims can easily be placed under the cleat, outside of the shoe. The benefits are immediate. Discomfort is reduced, and the rider is almost always amazed at how engaged the shorter leg feels throughout the pedal stroke, as if there had been a void in the arc previously. If a rider has any pain or discomfort that occurs on one side only, a leg length assessment is crucial for the best possible fit. CXHairs: You offer custom orthotics. What types of issues can be solved with footbeds? MASON: Custom orthotics can often help: Foot numbness, Arch pain, Forefoot pain and Knee pain. CXHairs: Beth Mason PT is signed on a sponsor for cyclocross’ first race of the year. Tell us about the SpectaCross event. MASON: Gladly! I was very excited when Ken Getchell approached me and asked me to sponsor one of the races at Spectacross, being held at the NJ State Fairgrounds on July 31st and August 1st this year. The event is unique for a number of reasons. It is essentially a pre-season event, and will allow us to get a move on with regards to cleaning the caked on mud off of our bikes that was left on there from Nationals in 2008. The event takes place while the NJ State Fair is running, so spectators will be out in force. Nearly a quarter-of-a-million people attend the New Jersey State Fair/Sussex County Farm and Horse Show every year. That is a lot of cowbell! This also allows for added entertainment for our families, who are often bored by watching us ride around in circles. According to Ken: “Cyclocross in the summer, trials skinnies, midway rides that go ’round & ’round, fried fair food, giant beer tent, the smell of livestock and enough spectators to give you stage fright-SpectaCross has more ways to puke than any other race in America!” … that’s what I’m talking about! In addition to racing on Friday night and sponsoring the B Master’s Race on Saturday, I also will be the Race Director for the events taking place on Saturday. Register now! CXHairs: What are your personal goals for the upcoming ‘cross season? MASON: Goals for 2009 Cyclocross season-fall down less, ride really fast, have a lot of fun! To learn more about the services Beth provides, visit www.bethbikes.com. To contact Beth, e-mail her at bethbikes1@gmail.com. You can also check out her blog at www.bethbikes-bethbikes.blogspot.com. Although I’m not a fan of shims, preferring any changes to beamed on the insole I love that she likes to fit according to road position. Can anyone confirm that a higher bb is north American, euro bikes don’t have higher bb?